On Saturday, the Women’s 7.5km Sprint set the ball rolling. As expected, the absence of the Russians Ekaterina Iourieva and Albina Akhatova left more space at the top for the other teams, an opportunity firmly grasped by the German squad. The poor condition of the snow saw a number of small accidents on the course, although the winds were not as great a factor as they were to be on the following day. Kati Wilhelm claimed victory over teammate Simone Hauswald, who pulled out an excellent performance on this semi-home fixture, being half-Korean herself, though she admitted after the race that she would need to ask her mother for the Korean for ‘silver’. Two of the remaining Russian biathletes, Olga Zaitseva and Anna Boulygina, arrived third and fourth respectively, with all in the top four hitting all ten targets. Belarus’ Darya Domracheva, who was perhaps one of the favourites before the race, placed a surprisingly poor 53rd, having missed a total of 6 targets. Although the event took place in the later evening, and the corresponding drop in temperature allayed fears about the melting snow, the conditions remained challenging for the Men’s 10km Sprint. The Brit Lee-Steve Jackson unfortunately provided some early comic relief, slipping fully on the snow and breaking his rifle. His troubles were only compounded by being unable to find the team’s replacement rifle. But even some of the strongest competitors found the conditions difficult, with Ivan Tcherezov looking to have injured himself badly in the race, eventually placing 38th. Despite some recent hiccoughs in form, however, it was to be the Norwegians who entirely dominated play. Starting late in the order, first Alexander Os and Halvard Hanevold set the fastest times, before Lars Berger, normally a poor shot, managed to post a time 10 seconds ahead. Unfortunately, the final Norwegian from the starting blocks, Ole Einar Bjørndalen, was to spoil that dream, squeezing an extra second out of the track to claim the gold. Given their recent form, it looked all set for the Norwegians to dominate the pursuit event from their top four places. Before the women started the second day, there was news of another disqualification, this time of the defending champion Andrea Henkel, who bizarrely fired a live round during so called “dry training” (firing blanks to practice trigger control). Normally this takes place away from the sporting arena, however due to strict gun laws in Korea, the athletes have to practice within the stadium building. 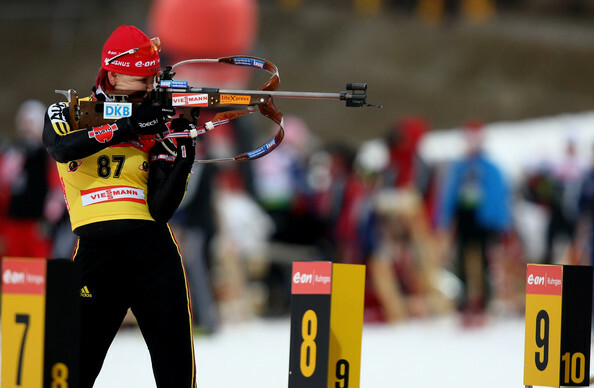 Nevertheless, the focus was on the leading figures in the sprint, and in particular Kati Wilhelm after Simone Hauswald made some early shooting mistakes. The winds, however, had picked up overnight, and the more difficult conditions left far more biathletes in the penalty lap than normal. In the end, both Kati Wilhelm and Olga Zaitseva missed 6 shots and were leapfrogged by the Swede Helena Jonsson who missed only 2 targets, and overcame the 55 second deficit from her sprint time. Darya Domracheva also missed only 2 shots, but managed to jump from 53rd to 5th in the pursuit, whilst mention must go to the Frenchwoman Marie Laure Brunet, the only biathlete in the women’s event to hit all twenty targets in the pursuit, earning her a similarly impressive ranking of 7th, having started 52nd. Germany’s darling Magdalene Neuner proved that whilst the conditions for shooting had considerably deteriorated, despite the overnight snowfall the track could still prove treacherous, skidding out on the final lap and looking to be in considerable pain as she slid over the line in 11th position. The men’s event got off to a far more contentious start. On the first corner, less than a minute into the race, leaders Bjørndalen and Berger for some reason skipped through the track markers and took a different route, though arguably not a shortcut, to the rest of the course. Much confusion followed, as a total of ten of the front running biathletes chose this altered route instead of the one marked. Whilst the rules clearly state that a diversion from the track of more than five metres, which results in a benefit in time, should result in disqualification, the race proceeded without intervention, though with many of the teams waiting anxiously for any news of a decision from the judicial body. Ultimately, the Norwegian advantage from the Spring event served as an excellent platform for them to dominate the Pursuit result, with Ole Einar Bjørndalen easing ahead more than 40 seconds over his nearest competitor, Maxim Tchoudov of Russia. The more difficult shooting conditions showed in Lars Berger’s tally, as he dropped down to 5th, missing a total of 8 targets, with the year’s current leader, Tomasz Sikora of Poland, jumping up to 4th place with some excellent shooting. Nevertheless, there was still plenty of indecision when the race was over as to how to deal with the ten offending biathletes. Most of the trainers, commentators and biathletes interviewed agreed that those involved were technically liable to be disqualified, but also considered that there had been little if any benefit in taking the wrong route. After some considerable debate, the board decided to penalise all of those culpable with a minute penalty, resulting in Maxim Tchoudov being awarded the gold. The decision came after an official complaint from the Russian team, and it seems clear that this decision was taken to ensure the penalty would affect Bjørndalen’s position. Nevertheless, after some delay and further complaints from seven other teams, the penalty was rescinded and the original result was left to stand. Quite what repurcussions this decision will have on the rest of the tournament is anyone’s guess. Certainly, the danger of a precedent for biathletes to go unpunished for flagrant breaking of the rules is now present, and it will be interesting to see what happens the next time someone is disqualified for stepping outside of the proscribed lines. Yet what I still fail to understand is why this mistake could not have been avoided from the beginning. The course was designed such that the biathletes had to ski over the bridge on every lap, apart from when approaching the shooting stands, which meant they should ski to the left and then under the bridge. The only exception to this, however, was the first lap, when the biathletes were meant to ski to the left of the bridge and then parallel to it, the course being altered thereafter—clearly the cause of such confusion in the first place. Whilst it is unfair to blame the organisers for a lack of snowfall or windy conditions, it is clear that there are other problems which need to be resolved to avoid further besmirching of first time hosts Korea’s organisational skills, ahead of their 2014 Winter Olympics bid for Pyongchang.